Tour reservations are available through the U.S. Capitol website and can be booked 3 months in advance. These will be large group tours. Members of congress also offer smaller tours through their office. The tours will most likely be led by an office intern. Occasionally, if things are especially busy in the member’s office when you arrive you will be added to a group tour. The Congressional and Senatorial offices are located on either side of the Capitol on the capitol campus. Allow two hours to make your way to the congressional office and complete the tour. Strollers are permitted on the tour, but if you can leave it in the member of congress’ office do, as there are lots of tight passageways and stairs. All of the buildings on the capitol campus are connected underground through tunnels and there is even a subway system connecting the buildings to the Capitol – the kids will love it! Once inside the Capitol some of the highlights include the Visitor’s Center (which is full of displays depicting the history of the building), the Rotunda and Statuary Hall. Within the Capitol each state has two statues representing famous statesmen (and women) from their state and most are located in Statuary Hall. Keep an eye out for the gold statue of King Kamehameha from Hawaii. The statues provide a great opportunity for a scavenger hunt for the kids! And be sure to ask your tour guide about the Whispering Gallery in Statuary Hall – a little magic! Also don’t forget to ask your member of congress for Gallery Passes. These allow you to go into the House and Senate Chambers and watch the proceedings if the House and Senate are in session. The Capitol campus is divided into three main sections: the Capitol, the Senate side and the House side. Security is tight and parking is extremely limited. If you do decide to drive, there is a parking garage located at Union Station on the senate side. But the best way to get there is to take the metro (DC’s version of the subway). If you want to start your visit at your senator’s office you will take the metro to Union Station (red line) and if you plan to visit your member of congress then you will take the metro to Capitol South (orange and blue line). Going into any buildings on the capitol campus will require you pass through security. There are often long lines so allow yourself extra time. Basically the security procedures are the same as the airport – with no 3D scanners! This means you will not be able to enter the buildings with any bag larger than would have fit in the overhead compartment on the airplane. Click here for a full list of restrictions. 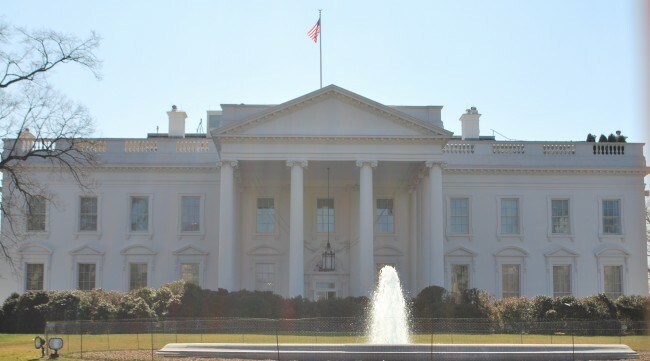 You must request tickets to tour the White House through your congressman or senator. They are very hard to obtain because there is a limited number of people allowed though each day. I recommend you put in a request with both of your senators and your congressman to increase the chances of getting tickets. Your should put in your request at least 4 months in advance, but reservations can be submitted up to 6 months in advance. You will be required to submit your security information (full name and social security number for each attendee) when you put in the request with your member of congress. Allow an hour to get through security and tour the building. Hours and Tickets: The self-guided tours are available from 7:30 a.m. to 11:00 a.m. Tuesday through Thursday, 7:30 a.m. to 12:00 p.m. Fridays, and 7:30 a.m. to 1:00 p.m. Saturdays. The tour is free and tickets must be obtained through your Member of Congress or Senator. Strollers are not permitted, along with a long list of other items. For more information click here. The self-guided tour will take you through all of the public state rooms in the White House. The White House Visitor’s Center has exhibits explaining the history of the White House and houses the gift shop. It is not part of the official tour and therefore you don’t need a ticket. This is a great place to stop if you are unable to get tickets to tour the White House. The visitor’s center is located around the corner from the White House at the southeast corner of 15th and E Streets and is open from 7:30 a.m. – 4:00 p.m.
As is true everywhere in DC, parking is limited. You will find office parking garages available around the White House and parking prices will be approximately $20. As always, the best way to get there is by metro and Federal Triangle (blue and orange lines), Metro Center (blue, orange, and red lines) and McPherson Square (blue and orange lines) are the closest metro stops. As you can imagine security is very tight at the White House and you will have to go through a security clearance process similar to the airport. Click here for more information on identification and security procedures. The Smithsonian Museums are a real treasure, in them you will see rockets, famous works of art and giant dinosaurs. You can watch an IMAX movie, see Dorothy’s ruby red slippers and let a bug climb up your arm. The best thing is that admission to all of the Smithsonian museums is free so if the kids have a melt down and can’t take any more, no loss. 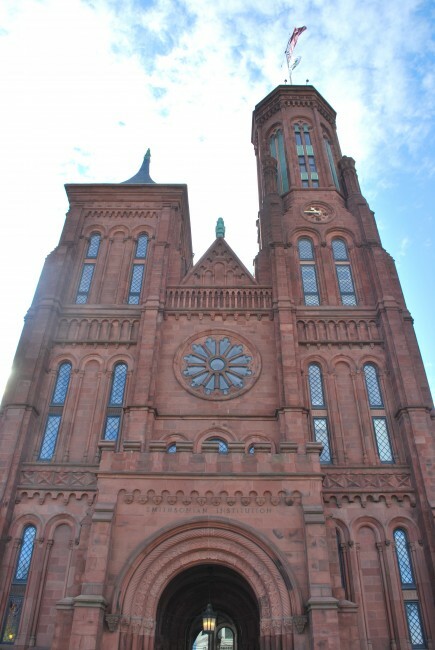 The Smithsonian Institution is made up of 20 museums. Ten of the museums are found along the national mall. It is a mile walk from one end of the mall to the other. Several museums feature IMAX theaters (Click here for a complete list). Tickets for the theaters will sell out, especially during the summer. It would be a good idea to buy your tickets in advance – can also be done through the website – and plan your tour around the show times. The theaters are a great break from walking! Hours and Tickets: Museums on the mall are open from 10:00 am – 5:30 pm, with extended hours during the summer until 7:30 pm. Visit the Smithsonian website for a complete list of museums, hours and locations, current exhibits, hands on activities and maps. No tickets are required as admission to the museums is free. Dining: Many museums have cafeterias, Click here for a complete list. Location: Click here for a list of museum locations. Metro Stop: Smithsonian – for museums along the mall. Strollers are permitted and family bathrooms are available. Food and drinks must be kept in your bags. 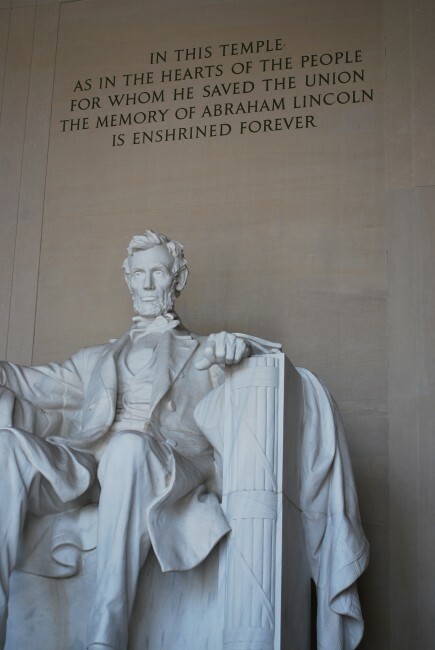 The Lincoln Memorial is a powerful place that has played an important role in our nation’s history. 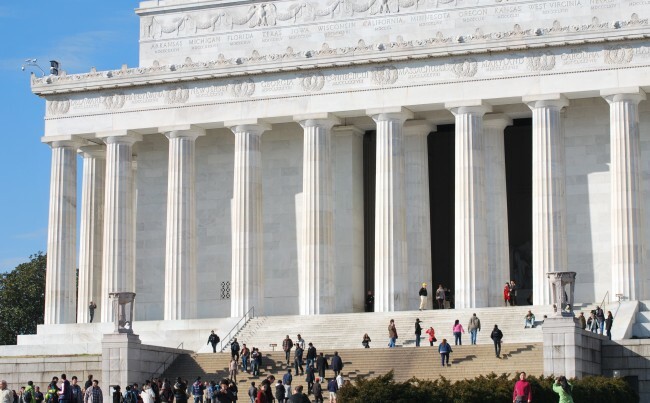 The huge statue of President Abraham Lincoln is something your children will never forget so run them up all those steps. There is an elevator, look for a park ranger and they can guide you there so you don’t have to haul that stroller up all of those stairs. Hours: The memorial is open 24 hours a day, but U.S. Park Rangers are on duty to answer questions from 9:30 am – 11:30 pm. 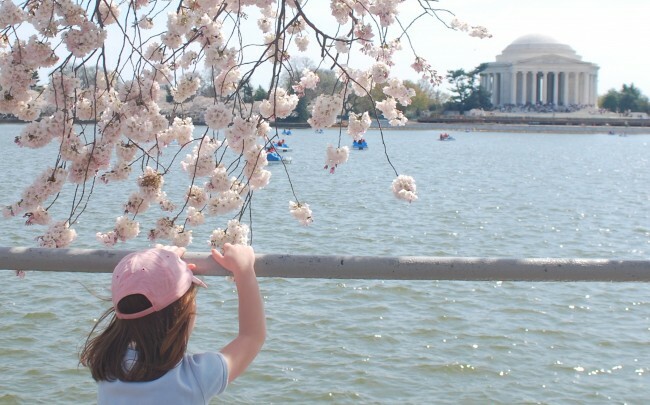 Metro Stop: Smithsonian – The walk is about half a mile past the Washington Monument, World War II Memorial and the Reflecting Pool. If you are worried about little walkers be on the look out for a rickshaw for a fun way to get there! Remember not only do you get a great view along the mall to the Capitol, but you can go around to the back of the memorial for a great view into Virginia too. 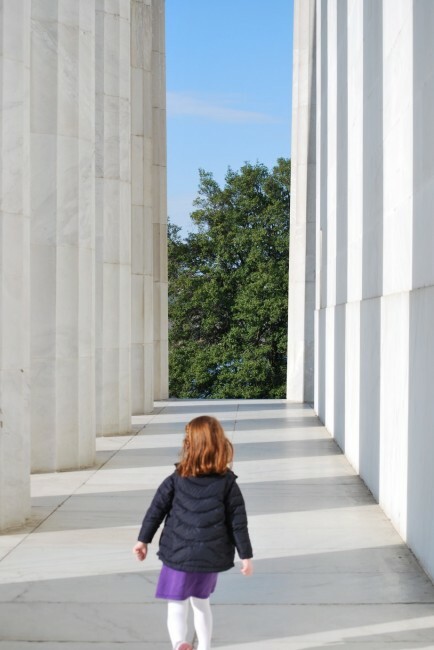 Scavenger Hunt opportunity – see if you can find the plaque on the ground commemorating Martin Luther King, Jr.’s famous “I Have A Dream” speech from the memorial steps. 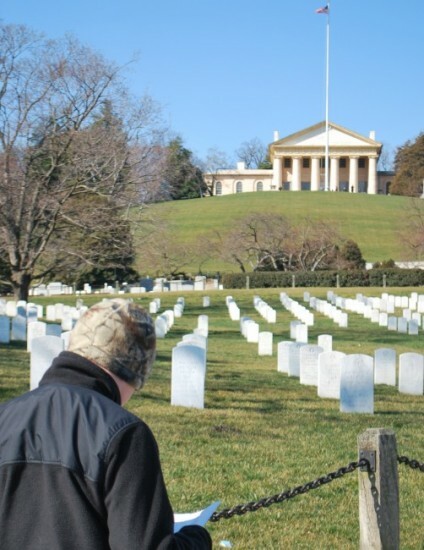 I still remember my first trip to Arlington National Cemetery as a child. The rows and rows of white headstones are something that will stay with you for a lifetime. Be sure to visit the Tomb of the Unknown Soldier and President Kennedy’s burial site with the eternal flame. The cemetery is also home to Arlington House or the Custis Lee Mansion. Click here for a history of the home which is not open for tours. Hours: The cemetery is open 7 days a week and 365 days a year. From April – September hours are from 8:00 am-7:00 pm and from October – March hours are 8:00 am – 5:00 pm. 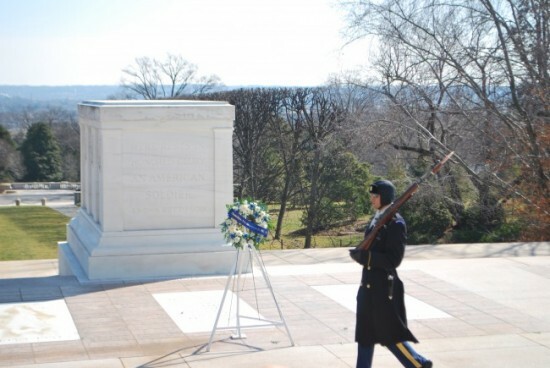 The changing of the guards at the Tomb of the Unknown soldier occurs every hour on the hour. Narrated bus tours of the cemetery leave continuously between 8:30 am – 4:30 pm. The Changing of the Guards at the Tomb of the Unknown Solider occurs every hour on the hour and is a moving ceremony that must be viewed in silence. If you have young children it is best to stand at the back or risk mean stares from the other tourists. p.s. Don’t forget to silence your phone. There is a narrated bus tour of the cemetery that visits the Kennedy Grave site, Tomb of the Unknown Soldier and the Arlington House. The tours leave continuously between 8:30 am – 4:30 pm. Tickets are $8.75 for adults and children 3-11 are $4.50. There is space to store strollers on the bus. Hours and Tickets: There is no charge to tour the Bureau of Engraving and Printing. The Visitor’s Center is open Monday – Friday from 8:30 am – 3:30 pm. Tour times vary based on the time of the year, see below for more information. Strollers are not permitted on the tour. Tickets for tours of the Bureau of Engraving and Printing (BEP) are available without going through your member of congress, but it is a lot easier if you do make the request through them. Tickets are distributed weekdays on a first come first serve basis beginning at 8:00 a.m. at the BEP. The line forms early and all of the tickets are usually distributed by 9:00 a.m. So instead, skip the line and call your member of congress. 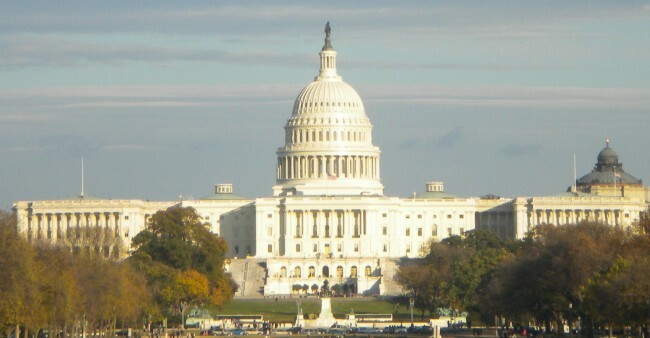 Congressional tours are offered Monday – Friday during the peak months of the D.C. travel season which is March – August. During the non-peak season no tickets are required or distributed. Allow one hour to tour the BEP and visit the gift shop. 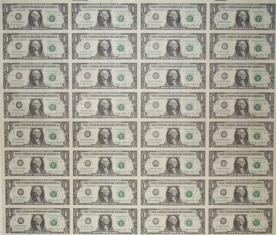 The BEP in DC is one of the two facilities in the country (the other is in Fort Worth, TX) where the country’s paper money (Dolla Dolla Bill Y’all) is made. It is amazing to think just how much money passes through this building each day – you’ll see lots of security cameras. There is also a fun gift shop where you can buy sheets of uncut one dollar bills and bags of shredded money (gifts to take to the friends back home) or have your face printed on a $100 dollar bill. I’m starting to repeat myself I know, parking is limited and although there are metered spots around the BEP and parking lots are located at the southeast corner of 14th & D Streets, SW; at 12th & Maryland Avenue, SW and at 12th & C Streets, SW, it is advised to take the metro to the Smithsonian stop. The BEP is a block away. If you have a ticket or need to wait in line for a ticket, you will enter the building on Raoul Wallenberg Place (formerly 15th Street). To take a tour without a ticket during the non-peak season, enter the BEP at the main entrance on 14th Street. The 14th Street entrance is also where the gift shop is located. Clearance for the BEP is quite simple. Backpacks, small bags, water bottles are permitted and you do not need a picture ID. You will have to go through a metal detector. 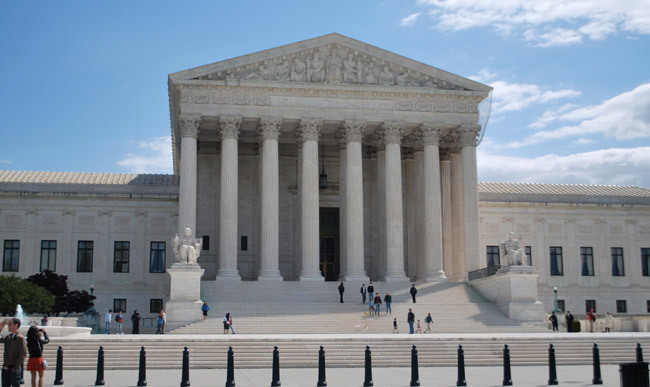 Hours and Tickets: There is no cost to tour the Supreme Court. Hours are Monday – Friday from 9:30 am – 3:30 pm. Reserved tickets are not needed to tour the Supreme Court. Guided tours are available Monday – Friday every 30 minutes from 9:30 am. – 3:30 pm. If the court is in session there are no tours offered. Click here for a schedule. It is advised you arrive at least 15 minutes before the tour begins to wait in line. If you would like to plan your day and have a specific tour scheduled, your congressional office can reserve tickets for up to 6 people for the 2:00 pm tour on a first come first serve basis. Allow one hour to tour the building. The guided tour will take you into the court room and give you a history of the building and the court itself. There is a gift shop located on the ground floor. The Supreme Court is also located on the capitol campus across 1st Street, SE from the Capitol. Click here for a map showing the entrance to the building. Taking the metro is advised as parking is limited and the two closest metro stops are Union Station and Capitol South. Again, if you decide to drive there is a parking garage at Union Station. Because no tickets are necessary you will not need a picture ID. You will be required to pass through a metal detector and your bags will be searched. Food and beverages must remain in your bags at all times.